It is once again that time of the year where the kings and queens of sports (okay maybe that was a hyperbole :3) come together to compete healthily in our annual Sports Day. Over the past month I have witnessed many great moments of practice and preparation for the day and probably a fair bit of drama too! This is the story of how I basically did something to contribute although I kind of sucked at sports. Okay, so let’s just say I am the not-very-athletic type. I hate exercise and if you ask me to run a 100 meter race I would probably finish first….from the back. 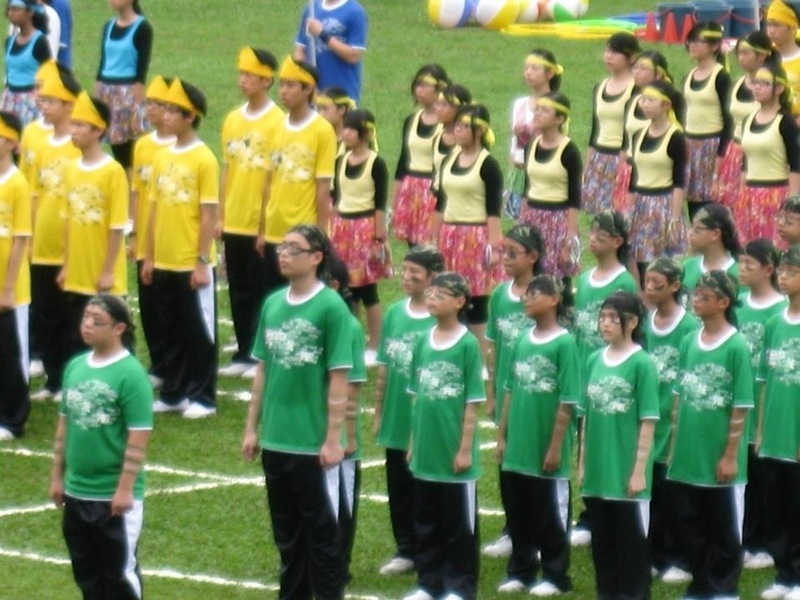 Yeah… So, in Form 1, they forced all of us to march. Me, marching? That means sacrificing shade and air conditioning for a rugged sunny field. Hmm… This was going to be a real challenge! Well, I thought to myself, “Might as well do something for the house. Better than sitting around doing nothing.” So, I gave up my leisurely desires and picked up this monotonous skill called marching. It was the first week of practice and we were already expected to know our basic commands and march in unison to the tempo of LEFT-LEFT-LEFT RIGHT LEFT. Lifting up your arm to scratch your forehead while at attention meant having 20 push-ups imposed on your poor soul. Fortunately, I didn’t have to do the push-ups or it would defeat my whole purpose of joining marching – to do something without having to do that much work. After a few weeks of grueling morning practice, we were finally brought to the test on D-Day. I still recall people passing out while we were singing the Negaraku. The blazing afternoon sun must have got to them. Before I knew it, it was over and a few hours later we were announced to be the winner of the marching event. It wasn’t too bad after all. After that, I joined marching every year since. This year, I’m hoping that Green House’s (Homerun) title as champion of the marching event would be restored. (yeah we lost last year 😦 ) GO HOMERUN! My advice to the people who are equally un-athletic as me: join marching! It’s an awesome experience and also a great way to build up your discipline. (minus the push-ups :3) If you’re too lazy to even join marching, there’s always something for you to do. Just do something and don’t sit around like a log! This Friday’s Sports Day! Who’s gonna win this year? Homerun? Bullseye? Touchdown? Slamdunk? We’ll just have to wait and see!